Having taken a brief while experiencing weather change from arctic to damp, drizzly wet and cold to the first hints of spring. I’ve allowed my mind to roam and wander through myriad topics, opinions and ideas. I’ve fallen back on what is slowly becoming a favorite of mine, and hopefully others… The Character Actor. Which, by its definition comes in all shapes, sizes and dispositions, The bookish nerd who finds the clue to the mystery at the end of the second reel. The hapless, everyday company man. The schemer. The wide eyed sap. Pre packaged and ready to be taken off by schemers and con men. The harried business agent. The fastidious curmudgeon. Ripe low hanging roles to be given best efforts. And one would be satisfied to master just a few, Though there’s a distinct and near anonymous few who can make these parts their own. And often amplify upon them. Please allow me to introduce one of that very rarified number. 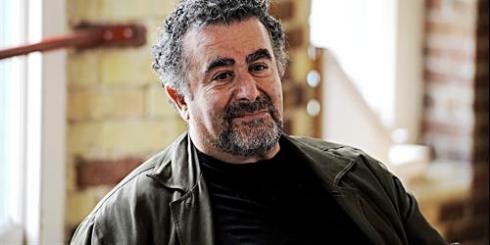 Consummate Character Actor: Saul Rubinek. I’ll wait for the surprised laughs and “Who?”s to settle down before continuing. Here is an actor who caught my eye back in 1980. In a forgotten little conspiracy gem, titled Agency. With Lee Majors and Robert Mitchum. Wrapped around a less than prosperous ad agency headed by Mitchum to bring in black ink and profits. The company handles vast clients covering liquor to sports wear to high-end camping and recreational gear. With Mr. Rubinek playing a kind of dumpy nebbish with a spoiled pet cat. His Sam Goldstein is just a bit too OCD, curious and clever. Notices inconsistencies and reports them to Lee Majors’. Philip Morgan. Who decided to handle his own investigation. Which slowly enters the realm of subliminal messaging right before a gubernatorial political campaign.Rather heady stuff for 1980! T hough not long in the film, Mr. Rubinek was able to sell the “McGuffin” and set the stage with suspense and tension As other friends and co-workers disappear and the clues lead upward toward Mr. Mitchum’s CEO, Ted Quinn. 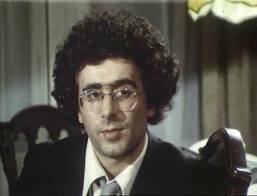 Which opened to doors to a role in Young Doctors in Love and rich, degenerate gambler, Steve Kirsch in Against All Odds. To iconic for fifteen minutes, perhaps drug dealing and money laundering screenwriter and director. Lee Donowitz in the over the top shoot ’em up finale of True Romance. While honing his craft on television with characters in Hill Street Blues, Men and The Equalizer. To then make his mark as antiquities collector, Kivas Fajo. 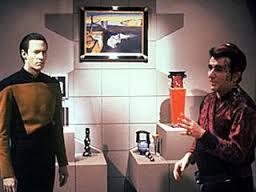 Who takes a fancy to Data in ST:TNG’s The Most Toys. Then on to lawyer, Jed Kramer in Tom Wolfe’s ridiculous, The Bonfires of The Vanities. And bespectacled journalist, W.W. Beauchamp in Clint Eastwood’s The Unforgiven. Then returning to television for two memorable characters in the updated, The Outer Limits and as layman investigator Saul Panzer and later, gossip reporter, Lon Cohen in the superb period series, A Nero Wolf Mystery. Bouncing back and forth for the role of the manager and agent, George “Bullets” Durghom. For a young, up and coming Jackie Gleason (Brad Garrett) in Gleason. A surprisingly good bio-pic that pays attention to the beginnings of this new medium. Its countless details and what is and isn’t “funny”! Then off to be a recurring character, Donny Douglas on Frasier. Before finding and defining distinctly memorable characters in the science fiction arenas. As perpetually frightened scientist, Dr. Carl Carlson during the first seasons of of Sy-Fy’s under rated, Eureka. Then finding a long-term home as the very set in his ways, earth tone friendly, long time agent, Artie Nielsen. Lord and master and curator of Warehouse 13. Who’s old enough and wise enough to plunge deep into comedic repartee (“Devil Child!”) with young upstart, Claudia (Allison Scagliotti) at arm’s length. While trying to keep older agents Pete (Eddie McClintock) and Myka (Joanne Kelly) in line and securing “artifacts” from around the world. Then taking time to create a rather slimy, fast taking bad guy, Victor Dubenich on TNT’s Leverage through several seasons. Then flipping the coin to give life to a paranoid and perhaps, rattled, Arthur Claypool. Who may have helped Finch (Michael Emerson) create the all-seeing, all-knowing computer on CBS’s Person of Interest. There was something about Mr. Rubinek that struck and stuck the first time I saw him. An ordinary looking guy. Not tall. Not muscular. Though endearing in his delivery. With a whiff of self-deprecation. Though, by no means a victim. Though, that is a story in itself. Not really taking himself too seriously, Yet, taking his tasks and roles very seriously. No matter long, front and center. Or in the background. Hitching up the reins and pulling the plow and moving the story along for however long his character was required. And occasionally beyond. Creating memorable characters for more than thirty years. And making the mediums of film and television much better for his inclusion! Nice highlight Jack. I haven’t seen Rubinek in anything for ages. For a while, though, he appeared in plenty of great films. I thought he was fantastic in Unforgiven and especially True Romance. Thanks for taking the time to peruse and comment so generously! Mr. Rubinek’s roles in True Romance and Unforgiven cemented his talents for many. What’s cool, is that he’s managed to latch on to a younger generation through his work with Sy~Fy and his character of Artie Nielsen in Warehouse 13 . His scenes with Claudia (Allison Scagliotti) are old school comedic gold! A chameleon who can handle any role. Equally at home in either film or television. Though I’d like to see him in more films. Yeah, I’ve not seen him in any films at all lately. I think the last time I seen him was in Frasier but that was many years ago. Hi Kevin. Nice tribute to a fine secondary man. I forgot all about him and it wasn’t until the Beauchamp shot when I thought, “Oh, yeah, him.” Great! He has had an interesting career. “Oh yeah, him” is the highest accolade a character actor can hope for. The pinnacle of an interesting career and an even more interesting life. As a post WWII German refugee immigrated to Canada. Where he caught the acting bug very, very early on in a Yiddish Repertory Theater . Resulting in his joining and later running The Stradford Shakespearean Festival Company of Stradford, Ontario. Before getting involved in radio and wider media. I just finished securing my soap box over on your site. A very intriguing and scary topic. 🙂 Appreciate your thoughts. Were you ever in the military? I’m a Navy veteran. So glad I’m retired out out of that social engineered, PC mess. Saul is a great supporting actor, all right. Thanks, Cindy. Once more, thank you very much for contributing a fascinating look at one of the supreme character actors working. Love Saul’s work, and he’s been in so many of my favorite films and television programs. Bravo to you both. Mr. Rubinek had been bouncing around in the back of my head for quite awhile. And I thought that he was more than due for his collected bodies of work. Definitely top drawer when it comes to film. Even if his character doesn’t make it to the final reel. Either as the nicest good guy. Or the nastiest, most arrogant bad guy. Yet wise enough with age to move to television and connect with Tim Hutton and others for A&E’s stock ensemble A Nero Wolf Mystery which bore notable fruit later on with NBC, Sy~Fy, TNT and CBS. Most assuredly, a master craftsman who makes himself available! This is sooo weird – I only watched True Romance the other day and was totally thinking the exact same as you! I’m actually a bit spooked out! Great post. The ability of an actor to outside the envelope and himself and be an absolutely superb, arrogant louse is always worth the time and effort of finding. And often enjoying. Robert Mitchum, Fred MacMurray and Lee Marvin could do it as easily as other lesser mortals breathe. And so can Mr. Rubinek. The real talent is in letting the audience care for their characters even as they are despised. And in this, Mr. Rubinek excels! Welcome, truemistersix. After this, I need to re-screen True Romance, too. Thank you very much. Oooh I love this guy! I remember him in various movies but mostly from his guest stint in FRASIER as Daphne’s boyfriend! Glad that you highlight this fine character actor, Kevin! Thanks for taking the time to Reddit thiis guest post, Ruth! 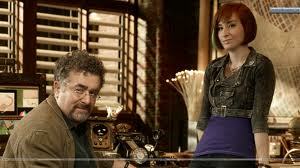 Watching Mr. Rubinek shift gears from drama and suspense to comedy and romance is always fun. And watching him keep up, hold his own and sometimes lead amongst Kelsey Grammer and Jane Leeves as Daphne proves and justifies Mr. Rubinek’s timing and delivery. Which is why he’s such a kick to watch in Warehouse 13 quietly teaching a younger generation the basics and more in bringing a laugh or coaxing out a tear from the audience. I had a ball bringing this subtle, superb talent to light! Just watched him in “Against All Odds” a month or so ago, he was irritating and loathsome, and you still felt regret at what happens to him in the film. That was my first memory of him as an actor. Sorry to say I have not kept up with all the TV work he appears to have done. This was a very nice piece on another one of “those guys” that make the movies work, Thanks. Great point about Saul character in Against All Odds, Richard. Thanks so much for the read and comment, my friend. Mr. Rubinek’s take on Steve Kirsch in Against All Odds is a master work of bringing live to a character so oily and rancid. One would need to wear a a RayCal chemical suit before sitting down next to him at a bar. Then subtly turn the time and allow you to empathize and feel sorry for him later. The mark of a true master. Loved this tribute to a very talented but often ‘under appreciated” actor. I’ve been a fan for about the same time as you. I first caught him in Ticket to Heaven and liked what he did with the role. But one of the roles that really hooked me was The Outside Chance of Maximilian Glick and I’ve tried to watch everything he’s been in since. My ‘collection’ of his films/TV appearances (starting with Agency) would probably be considered impressive. He’s a marvelous actor who never fails to bring his characters to life and to entertain me in the process. Thanks for taking the time to focus on him in your blog. He certainly deserved any accolades he gets. And thanks very much for such a wonderful comment! Mr. Rubinek’s talents snuck up on me the same way. A master craftsman who may not be on screen for long. But makes that time memorable in myriad ways. While tempting those watching to want more. You are more than welcome and I hope to see you drop by and comment more often!